What does S.C.O.B.Y. stand for anyways? Symbiotic Colony of Bacteria and Yeast. This means a bunch of bacteria and yeasts came together in the perfect environment and created their own colony that takes the form of cellulose- in some cases a Kombucha SCOBY – or in others milk kefir SCOBY’s (milk kefir grains) and others still Tibicos scoby’s (aka water kefir grains). We often hear SCOBY associated only with kombucha, however there are many forms of these colonies that take different forms and have different functions, again with different habits and appetites. As they eat, glucose, lactose or whatever they like, they are growing and multiplying theoretically FOREVER! This is exciting until it can become overwhelming! What can you do when you have 101 too many kombucha SCOBY’s!? If you are like me, you have probably become somewhat attached to every single one of these funny disks and can’t muster up the courage to throw them out and can’t find enough friends who are bizarre enough to adopt one. 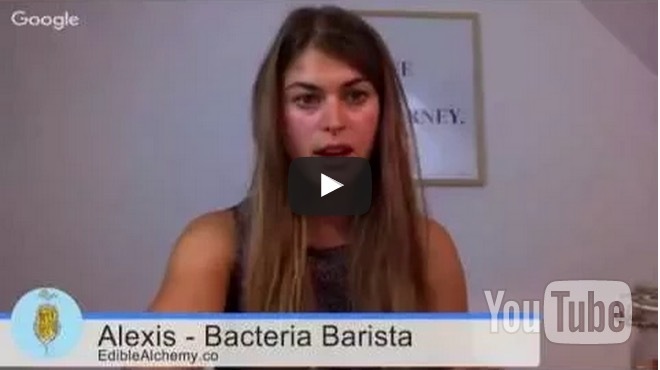 Watch the free webinar first to know how to make your own kombucha! 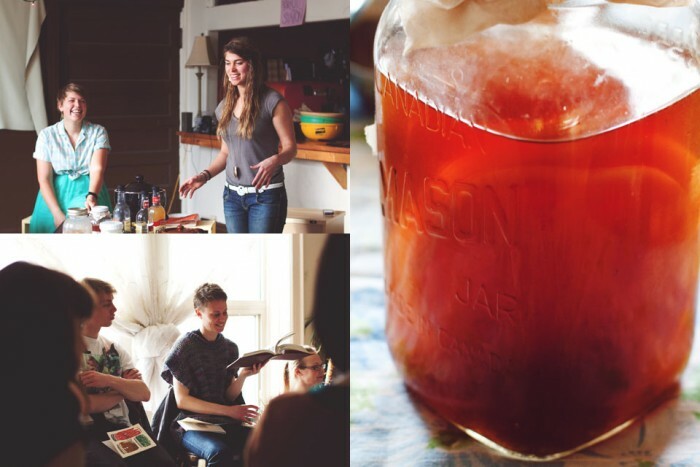 This post is here to help you find your creative outlet for all those extra kombucha SCOBY’s! Here I have transformed the acronym S.C.O.B.Y. into something a little different in order to widen the horizon of possibilities of that ever-growing SCOBY-Hotel on top of your fridge. 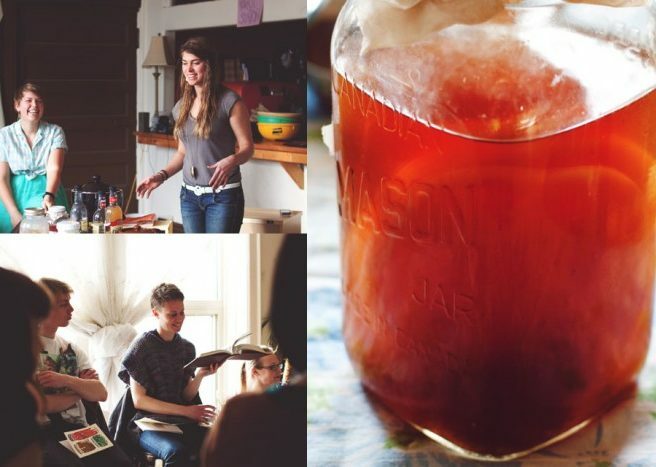 SCOBY = Sculptures, Clothing, Organics, Body-Care, and Yumm-eat it. As you have probably noticed, SCOBY’s can become quite skin-like, thus when dried out it is pretty much leather-like as the SCOBY is a cellulose mass. What can we do with this leathery material? Grow your own clothes! Suzanne Lee has become the go-to artist for this SCOBY-textile concept. She grows her SCOBY’s in huge tubs, then dries out the SCOBY and utilizes it for its leather qualities in order to create her fashionista projects. Check out her more detailed TED Talks here! If you are into growing your own bacteria, chances are you are into growing your own plants and things that grow in general. If so, than consider repurposing your extra SCOBY’s, and kombucha tea into your garden! Many plants love acidic soil, as the low pH allows plants to absorb al the nutrients that they need in order to grow and flourish. Simply blend your SCOBY or any extra kombucha vinegar into a compost tea to feed those plants and give a rich soil environment. Seedling pots – Get ready for the seeding season! In cold places, we need to start seeding inside before we take those delicate seedlings outdoors. A creative and reusable container is to take those thin SCOBY disks and dry them out in muffin tins so they become hard little cups. When your seedlings pop up and are ready to be put into the earth, just plant the whole ‘cup’ back into the earth to add acidity to the soil and biodegrade. House hold cleaners - Over-brewed kombucha can become very potent, enough that it has become vinegar – no more sugar. Use it as a house-hold acidic cleaner to kill any bad bacteria growing on surfaces. Cooking with kombucha vinegar is great, or even as a salad dressing, or bread dip. Face mask – Girls night/ detox night!– put a SCOBY on your face for 15 minutes and let the toxins be pulled out of your skin. If you have sensitive skin, make sure to test a small piece first. Often after a SCOBY facemask, as in most face treatments, the face is red for the first moments after and then goes away. What is happening while this crazy cellulose creature is on your face? The culture is pulling circulation to the surface of the skin to regenerate skin cells. The low pH (acidity) of the culture is actually acting like a skin peel taking away dead skin cells and thus leaves our skin feeling nice and smooth. 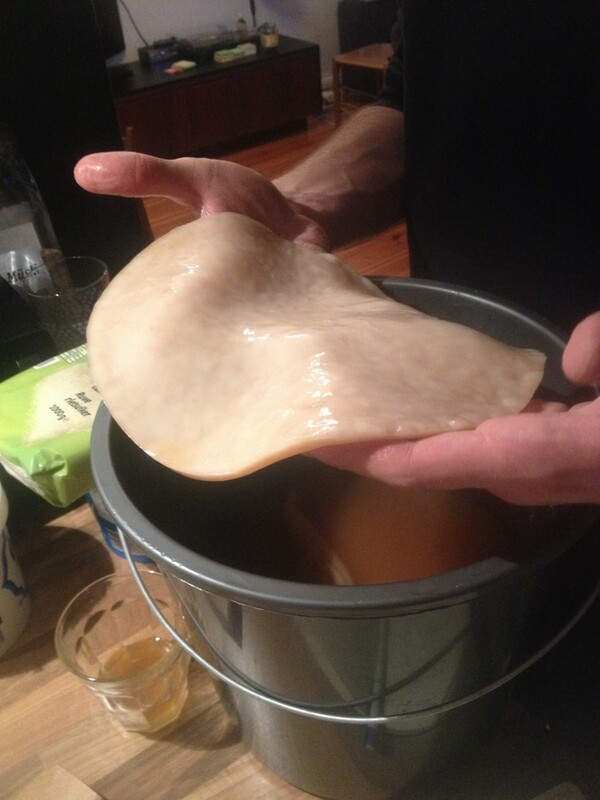 Living bandage – If you have ever handled lots of kombucha SCOBY’s, you will have noticed their skin like texture. We can actually use it as a living skin topically to help heal minor skin irrigations, burns and wounds. By topically putting a SCOBY on the wounded area, the ‘living skin’ speeds up the healing process as the low pH inhibits growth of harmful organisms and further protects us from infections that are common during the healing phase. 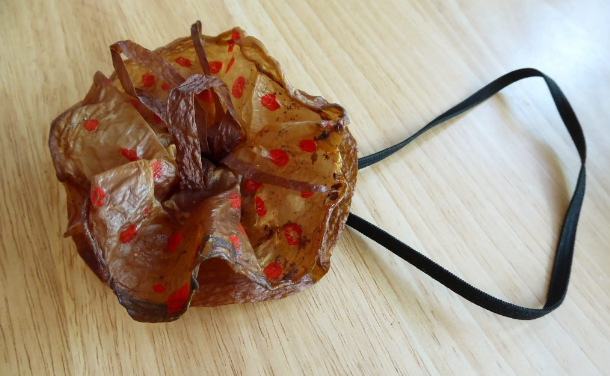 Scoby dumplings, vegan oysters, and more - My friend Rosemary from Baltimore did a residency in the Nordic Food Lab and wrote a beautiful experimental blog about edible young SCOBY possibilities – check out her food-art here! Probiotic HARIBOS – cut a thick SCOBY into little gummi-bear sized chunks, sprinkle some ascorbic acid and sugar coating on them and dehydrate them at a low temperature or in a dehydrator to get the most chewy Probiotic Haribo candies. Remember to eat them lightly as a SCOBY is packed full of probiotics and too many can give a stomach ache – express the same caution as when eating too many Sour Patch Kids I guess ;). Kombucha Vinegar - Often having a SCOBY hotel contributes to super strong kombucha concentrate – a pure vinegar can come out of this which we can further use for cooking a meal or add to our salad dressings. not only yumm for humans, but yumm for animals too! Dog jerky – The market for Probiotic-dog treats is enormous! If there are dog owners spending thousands for dog jewelry, jackets and booties, they will also be looking to keep their pups gut in check. Take a SCOBY cut it into long slices or leave it as a disk. Sprinkle some BBQ salts or bouillon on it, and dehydrate them into jerky strips. Your doggy will enjoy chewing on the jerky at the same time as gaining valuable probiotics. A healthy canine gut means healthy bowel movements and a slick glean coat. Chicken feed – chickens love chopped up SCOBY mixed in with their feed. Hey - even the smallest digestive system can use some probiotics – which contributes to better egg production and happy chickens. As you can see, the excess Kombucha SCOBY crisis can be conquered in various ways – if you have more – please send us a message so we can share it with the community!